i'm trying to validate a software Interest Calculation. The defaults given are as followed. 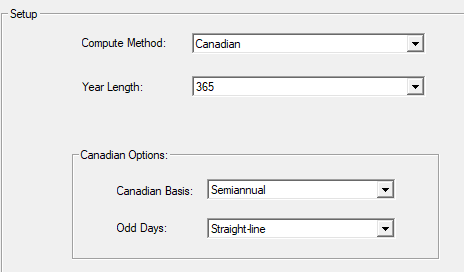 Now if I set the compute method to be Canadian and set Canadian Basis to Semiannual I get an interest accrued value of $4,082.42. Canadian mortgages are compounded twice yearly. The interest rate, 10% is a nominal rate compounded semi-annually. That is a lower rate than 10% nominal compounded monthly. Not the answer you're looking for? Browse other questions tagged loans amortization or ask your own question.